Now that you know about the best mineral sunscreens, there&apos;s one more product to consider adding to your summer beauty arsenal. Also known as "dry sunscreen," it can give your daily suncare routine a little extra somethin&apos;-somethin&apos;. Not in replacement of your regular sunscreen, mind you, but in addition to it. Here&apos;s why. Three of my favourite powder sunscreens from Colorescience, Éminence and Laboratoire Dr Renaud. Powder sunscreen goes on over your makeup. How convenient is that? It looks and feels just like any loose face powder, is available in both translucent and tinted versions, and mattifies at the same time as it protects. Besides your face, you can also put it on your chest, hands and down your part. Powder sunscreen offers SPF 25 to SPF 50 protection. 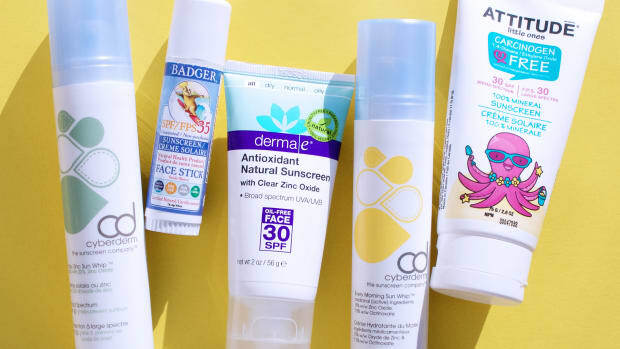 Thanks to the same ingredients—zinc oxide and titanium dioxide—that you see in creamy mineral sunscreens, powder sunscreens also have a sun protection factor (SPF) on their labels. Powder sunscreen gives you an extra layer of protection. I&apos;m not suggesting powder SPF should be the only sunscreen you use to protect your skin—at least not for prolonged outdoor exposure. (I doubt most of us would apply it liberally enough, plus overly powdery faces don&apos;t look good!) But powder is perfect for adding an extra layer of protection on top of your favourite lotion-based sunscreen. Powder sunscreen is easy to re-apply. We already talked about the whole sunscreen re-application conundrum. I think powders are the best solution, because they contain safe mineral filters, are super-quick to apply, and won&apos;t mess up your makeup. Powder sunscreen is portable. When you get caught without enough sunscreen on, it&apos;s the worst. I suggest keeping a powder sunscreen in your purse at all times as a back-up or "emergency" sunscreen—you never know when you might need it! Each tube comes with a built-in, self-dispensing brush, so it&apos;s easy to use on the go. Are powder sunscreens banned? No. 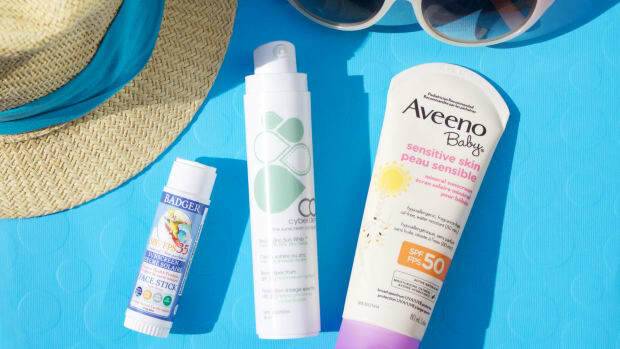 According to Health Canada&apos;s sunscreen monograph, powder is considered an acceptable form of sunscreen, and can currently be purchased in Canada. In the US, the FDA stepped up its regulations on powder sunscreens in 2013, requiring all manufacturers to submit their products for approval in order to continue selling them as SPFs. Unless you&apos;ve somehow managed to get hold of old stock, the powder sunscreens now sold in the US have gone through this approval process. What about nanoparticles and inhalation? These are definitely valid concerns about powder sunscreens. The products I&apos;ve suggested below use micronized forms of zinc oxide and titanium dioxide, not nano-sized particles, so the risk if inhaled is much lower. (Dr. Annie Chiu, for example, doesn&apos;t think there&apos;s any danger.) To be on the safe side, I try to hold my breath and avoid inhaling when I&apos;m swirling the powder over my face—it only takes a couple seconds, so no big deal. Colorescience Sunforgettable Loose Mineral Sunscreen SPF 50 is probably the most famous powder sunscreen. With 24.1 percent zinc oxide and 23.9 percent titanium dioxide, you&apos;re getting SPF 50 and complete broad-spectrum protection. It comes in four tints, gives a matte finish and is water-resistant. Supergoop! 100% Mineral Invincible Setting Powder SPF 45 is the newest sunscreen powder on the market, and has a sheer, silky, non-drying texture. With 24.5 percent zinc oxide (and no silicones! ), it offers an SPF 45 and full broad-spectrum protection. There are three matte tints, along with a translucent version, and they promise no flashback in photos. Tarte Tarteguard Mineral Powder Sunscreen Broad Spectrum SPF 30 is another new powder SPF, with 10 percent zinc oxide and 8.6 percent titanium dioxide for an SPF 30. It comes in one shade, translucent, to suit all skin tones. ILIA Moondance Radiant Translucent Powder SPF 20 is ideal if you&apos;re looking for a product with very clean ingredients and no silicones. Just keep in mind that it&apos;s only an SPF 20, with 14 percent zinc oxide. It comes in one translucent shade, but rather than matte, the finish is luminous. (Don&apos;t worry though, there&apos;s no glitter or sparkle in here!) They recently improved the packaging to ensure the powder flows through seamlessly. Éminence Sun Defense Minerals SPF 30 has the shortest ingredients list here, and no silicones, which I appreciate. It contains eight percent each of zinc oxide and titanium dioxide for an SPF 30. What&apos;s great about this one is the selection of shades; it comes in translucent as well as five different tints. If you set it with a face mist, it becomes even more water-resistant. Derma E Sun Protection Mineral Powder SPF 30 is a high-zinc (20 percent), high-titanium (17 percent) powder that gives you SPF 30 production. It comes in one translucent, mattifying shade, and is oil-free and silicone-free. This is a good choice if you prefer more natural products. 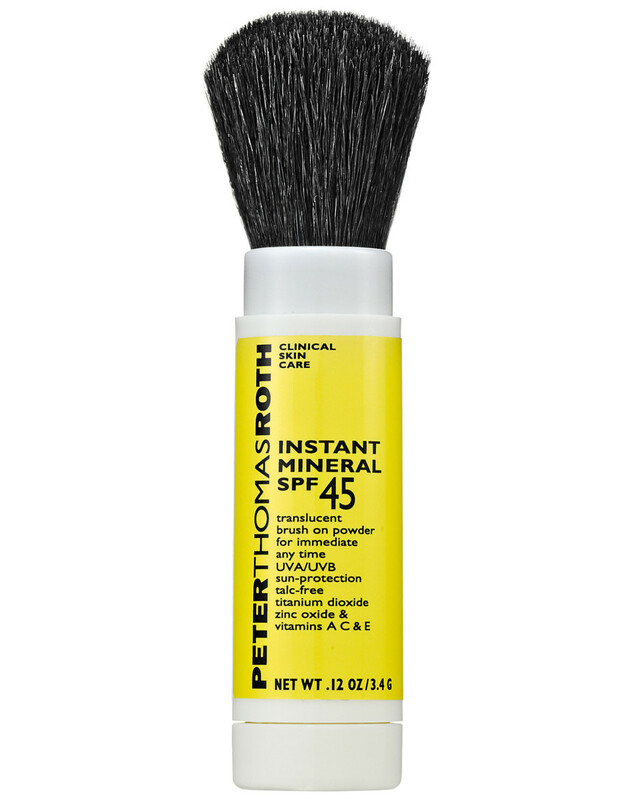 Peter Thomas Roth Instant Mineral SPF 45 was recently reformulated to include even higher levels of active ingredients. 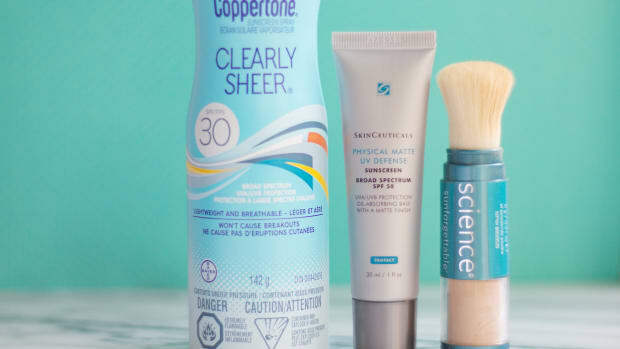 Although the SPF 45 hasn&apos;t changed, it now has 20.75 percent titanium dioxide and 19.6 percent zinc oxide, which give you broad-spectrum protection. It comes in one transparent matte shade. Bonus: You can even use it as a hair powder! Peter Thomas Roth Oily Problem Skin Instant Mineral SPF 30 is specifically made for oily and acne-prone skin. So there&apos;s salicylic acid in here to help prevent breakouts, along silica and kaolin clay to absorb excess oil. This one is an SPF 30 but still has very good levels of actives: 14.7 percent zinc oxide and 13.65 percent titanium dioxide. It comes in one transparent shade. Mineral Fusion Brush-On Sun Defense SPF 30 is the most affordable powder sunscreen—yet it has a whopping 20 percent zinc oxide and 17.3 percent titanium dioxide to give you SPF 30 broad-spectrum protection. It comes in one transparent shade, and has a short, silicone-free ingredients list. The silica is great for controlling oil. Sweat Cosmetics Translucent Mineral Powder SPF 30 contains my favourite oil, squalane, which is super stable and protects against free radical damage. It&apos;s an SPF 30 with 20 percent zinc oxide for complete broad-spectrum protection. You also get 40 minutes of water- and sweat-resistance, yet it is silicone-free! This one is translucent, but they also sell a tinted foundation version, below. Sweat Cosmetics Mineral Foundation SPF 30 has a little less zinc oxide (16 percent), but you&apos;re still getting SPF 30 protection in a light coverage foundation formula. It comes in an impressive five shades, with an even higher level of water- and sweat-resistance, up to 80 minutes. This one is also silicone-free. Brush On Block SPF 30 Natural Mineral Powder Sunscreen contains 15 percent titanium dioxide and 12 percent zinc oxide for a respectable SPF 30 level of broad-spectrum protection. It&apos;s water-resistant, and comes in both a translucent shade and a "tanned" version. Arcona Nearly Invisible Dry Mineral Powder SPF 30 contains both zinc oxide and titanium dioxide, but they don&apos;t give the percentages. 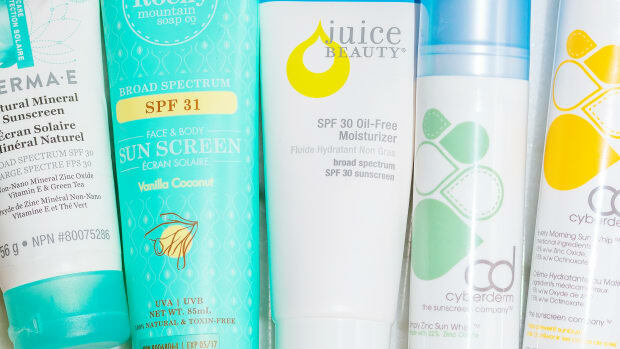 So it&apos;s hard to compare this to the other products—all we know is that it&apos;s an SPF 30! It&apos;s water-resistant, which is great, and has a finely-milled, lightweight texture. There&apos;s just one transparent shade, but the brand also sells a tinted SPF powder, below. Arcona Sunsations Mineral Makeup SPF 25 also has zinc oxide and titanium dioxide, but again, they don&apos;t disclose how much. Since they only claim SPF 25, I wouldn&apos;t rely on this as anything more than a top-up to your regular sunscreen lotion. The great thing about it is it offers a little more coverage than the other powders, and is sold in the biggest shade selection of all—there are 13 shades in total. Plus, it&apos;s silicone-free. Jane Iredale Powder Me Dry Sunscreen SPF 30 only contains titanium dioxide—17 percent of it. So it&apos;s not going to give you as much protection as the zinc oxide powders, since titanium dioxide is not as effective against UVA rays. Still, it&apos;s a perfect topper for zinc oxide lotions, and is water-resistant for up to 40 minutes. There are two shades, plus a translucent option. Touch In Sol Pang Pang Sun Cutting Powder SPF 30 contains mostly physical sunscreen filters—13.93 percent titanium dioxide and 2.94 percent zinc oxide—plus a small amount, two percent, of octinoxate. It has one of the shortest ingredients lists, and should help with oil control, thanks to the witch hazel. It comes in one transparent shade with a weightless, finely milled texture. Laboratoire Dr Renaud Loose Powder SPF 50 gives you full broad-spectrum protection with the highest possible level of active ingredients: 24.8 percent zinc oxide and 23.4 percent titanium dioxide. That&apos;s more than any other powder on this list! There are just two shades, Light and Dark. Carry a powder sunscreen in your purse and you&apos;ll never be caught without sun protection. You can never be TOO prepared to face UV radiation, which is why I love the concept of powder sunscreen! Again, I suggest not relying on powder sunscreen as your only sunscreen. Use it as a top-up and a back-up, and you&apos;ll always be sun safe! Have you tried powder sunscreen?